ï»¿ Stroke Family - The Sensory Trigger: Talking using the Right Side of the Brain. The diagram above shows how signals from the eyes and ears connect in a more roundabout way to the speech center, while the signal from the hand links directly through the speech motor channel. The next picture shows a typical left hemisphere stroke. The right hand may still recover, but the connection to the speech center is still damaged and flow to that area is probably not enough to recover speech. This is true even though it is less blocked than the pathways from the eyes and ears. Remember, Broca's area is the vocal Speech Center, while Wernicke's is where spoken language is understood. Signals must route from the ears through Wernicke's Center first before going to the Broca's area. The stroke survivor hears talk inside their head, but the signals can't go through the blocked Broca's Speech Center. Some aphasics will be able to say just bits and pieces or jumbled speech. This is the signal getting partway through the Broca's area. The signal bounces off the blocked areas, picking up whatever fragments are left. The next picture shows all the sensory channels flowing into the undamaged speech center on the other side of the brain. The kinesthetic signal or touch signal from the hand connects to the speech area through a channel that goes through the speech motor area. 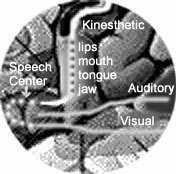 It goes in and out of the speech center without crossing into any other area of the brain like the visual and auditory signals do. It does, however, connect to the cortex or thinking part of the brain and signals go back and forth to the passive speech center on the other side of the brain. The signals from the eyes and ears route through their own specialized channels that do not route through the speech motor area of the brain in route to the speech center they route to the speech motor area only after going first to either the visual cortex or the auditory processing centers and then through the speech center. This is quite different from the direct link from the hand or kinesthetic channel. Both right and left ears and both right and left eyes are trained to send speech and language signals mainly to the dominant side. 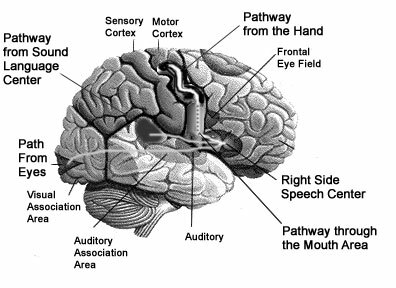 Again, the visual and auditory signals have to go through the Broca's speech center first, BEFORE they route back through the speech motor areas, as you can see in the diagrams below. As you can see, just using pictures and verbal commands without the touch signal makes the signals fire on the dominant side where they slam right into the damaged area of the brain. By using the other hand, the signal is now routing the touch signal through the speech center on the other side of the brain. This attracts the eye and ear signals to it, drawing them over to the other side. With continued practice the signals from the eyes and ears learn to connect with this speech center more than the other one. Left-handed people must reconnect and reintegrate so the signals are trained to or reestablished on the other side. The process is the same. Here's a close up of the signals going into the right hemisphere speech center. It looks just like signals going to the left speech center before the stroke. 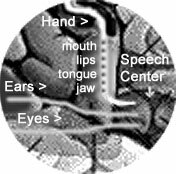 The signals from the alternate hand go directly into the speech area, passing through the same area of the brain as the mouth, lips, tongue and jaw. The signals from the ears and eyes, on this side, however, have to reintegrate. Normally they would interpret a speech or language signal and send it quickly across to the dominant speech center on the other side of the brain. The right side speech center is trained to be passive and only listens and plans speech (except for some automatic speech, swearing and deeply imprinted speech) it isn't used to sending the signal back out the speech/motor channel from this side. 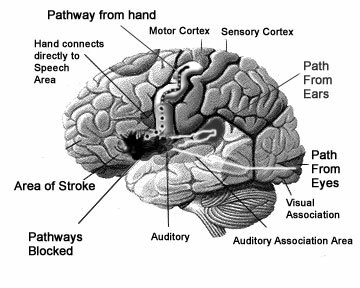 If the signal of the hand is made strong enough and is triggered repeatedly, the brain can learn to process these signals into speech commands and send the signals from the ear and eye on the other side to this side whenever what is heard or seen is recognized as language signals. Then it must learn to send the signal to talk through this side. There is a strong possibility that the brain eventually discovers that this new channel is unblocked. In order for this speech center to learn to talk, signals will have to switch back and forth over the corpus callosum (the bridge between the two sides of the brain) to reconnect all the words stored on the other side. This will take time. Once the connection is made, speech will tend to be slower, because the brain is still switching back and forth to retrieve words, memories and information from the cortex and other areas from the other side of the brain. The areas that used to be free to plan ahead for speech have to work overtime, and switch back and forth between functions. The practice of using only verbal commands with pictures in speech therapy tends to send signals back to the damaged side or at least, we could say it sends only weak signals to the right hemisphere speech center. Using the Sensory Trigger techniques, only the kinesthetic or touch signals, the signals from the hand and fingers, bypasses the blocked areas and routes to the right-side speech center. This lays down a "sensory footprint" or "trail" that can become the new pathway. The kinesthetic channel is the sensory system that is most changeable we learn through touch more easily than we do through sight and sound. Once this new pathway is forged, any kind of speech therapy or informal speech practice will be more effective. With the new pathway speech recovery is possible. Without it, speech recovery is limited at best. Some patterning from the left hand is accomplished by doing everyday things like eating or using a communication board, but it is usually not enough to establish a new pathway to the undamaged speech center. It isn't enough to trigger speech. The Sensory Trigger Method restructures language processing in the brain so it can talk again. People who are left-handed use the very same method. Their left hand will be finding and forging a new channel through the kinesthetic memory system. The Pathway to Recovery guide and The Sensory Trigger will explain how to adapt the method to a left-handed person. Computer programs help enhance speech recovery because the person usually must use their other hand to operate the program. Speech pathologists, neurologists, special education teachers, as well as families with stroke survivors will be interested in reading this paper. According to the findings in the paper, there are several things that are required for speech recovery in most cases. The Sensory Trigger Method uses a number of left-hand strategies to break through this "speech barrier". All of the programs and materials that we offer teach and apply this research. The Let's Talk program automatically gives you the auditory cue AFTER the touch cue and visual cue. The instructions in the manuals explain how to interact with the stroke survivor, how to do the right number of repetitions without over-doing it, how the method can be individualized for different people, how to deal with and relieve frustration and how to fit all of this into the context of your everyday life.